We have recently had 3 big dead eucalypt trees removed by our local arborist. One was struck by lightning, and the other two were killed by mistletoe. We paid the minimum, to just have them dropped to the ground. We took it on our selves to cut them up and remove all the blocks to storage and seasoning. We spent several days cutting up al the logs into small sizes, such that we could manage to move them. Janine and I spent a week whittling away at the big number one log and finished the first tree by ourselves, but then had the wonderful assistance of some friends and pottery students for a day. We have been so lucky to have these people volunteer their help for a day and come along to give us a hand in shifting all the logs that Janine and I had spent the week cutting up. It’s a huge task to lift and load several tonnes of wood and then shift it and stack it for seasoning. This is all very vigorous work and we sweat copiously in the heat. The larger, straight pieces were all cut to kiln size ‘hob’ length, while all the scrappy, small or bent pieces were all cut to 200mm. length for splitting for the house kitchen stove. The main central log was over 600mm dia. So it was too big to manage at ‘hob’ length of 700 mm. So I cut it to 200mm. just so that we would be able to manage the lifting and stacking. I rigged up a couple of planks , so that we could roll the bigger lumps up onto the truck to be carted to the wood shed and splitter. This should keep us going for a few years in the kitchen stove. All the smaller dia. logs were cut to ‘kiln hob length’ of 650 to 700mm to suit the fire-box of the kiln, and then stacked for seasoning. A year or two should do it. There is about 7 or 8 tonnes in this load of 19 stacks about 1200mm high. We have had our new Tesla battery for a couple of weeks now and we have just done our first electric kiln firing on sunshine. We have had 3 kW of solar PV panels on our kiln shed roof for over a decade now, but we have only recently managed to get our hands on a new PowerWall 2 lithium battery, after being on the Tesla waiting list for over a year. The battery is working perfectly, just as we imagined, and now allows us to run our house and pottery almost totally independent off the grid. We had decided to stay connected to the grid however, as we generate far more solar electricity than we use ourselves most of the time, and up until recently we got a very handsome rebate payment for the power that we sold. Now that the generous rebate program has ended, it is much better for us to store our daytime solar electricity excess and use it ourselves at night, instead of paying the premium cost of buying back ‘green’ power from the grid at night. Of course we don’t have to buy ‘green’ power. We just choose to, because we made a decision 13 years ago to remove ourselves from the coal economy. Which we have done. We are of the belief that global warming is real and that it is man-made. Burning coal to make electricity is a very big part of the problem, and green power is going to be part of the solution. It’s affordable, it’s here now and it’s the future. In addition to going solar, we have also declined to use concrete slabs in our building construction and we choose to drive the smallest fuel-efficient car that we could afford. When we put the first Australian made solar panels on our roof 11 years ago, we didn’t do it to make money. We did it for ethical reasons. However, as it turns out, we paid off the panels and made a slight profit over the decade, because we were paid one or two thousand dollars a year for the power we sold to the grid, but we also didn’t have an electricity bill for that decade. A saving of many more thousands of dollars. These original PV panels still have another 15 years of full productive life in them, before their output starts to decline. I’ll be long dead before they stop working. We recently added another 3kW of PV at the same time as the battery. As I intend to buy a fully electric car as soon as they become available at an affordable/reasonable price. So now with everything in place, we have just completed our first electric kiln firing using our own solar power, firing through the day on sunshine up until just after lunchtime and then into the afternoon on a mix of solar and battery, then ending in the evening mostly on the battery power. Yes, it works. You can fire on sunlight. The future has arrived! Below you can see a graphic of our power usage though the day. The high blue spikes are the electric kiln switching on and off. The golden-yellow hump in the middle, above the line is the solar panel output from the roof. The green areas below the line is the battery being charged up from the solar PV panels in the morning and corresponds perfectly with the yellow solar area above the line, up until noon. The solar panels are both firing the kiln and charging the battery up to noon. After 12 noon, there was some cloud that came over and the solar output dropped down. By about 3 pm. the PV panels no longer generated sufficient power to both fire the kiln and charge the battery. After 3pm the clouds cleared and solar output increased again and fired the kiln with the assistance of the battery. From 4 pm onwards, the battery fired the kiln with assistance from the solar. Solar production ceased at about 6.30 and the firing finished at about this time also, more or less solely on battery power. The small zigzag ripple on the base line is the household usage, mostly this comprises the fridge compressor switching on and off. I should also point out that I was also working in the kiln factory throughout the day and using some very heavy 3 phase sheet metal machinery, welders and plasma cutter. This is included in the blue spikes. The lower line of blue spike peaks is the kiln alone, and the higher level of blue spikes is the kiln and the heavy electrically powered machinery working at the same time. The following day, the PV panels charged the battery back up to full power again by about 1.30pm. Solar output is shown in yellow. The battery shown in green is being charged below the line. Once the battery is fully charged, the solar output is then switched to sell back into the grid for the rest of the day. Shown in white below the line. Household usage is shown in Blue above the line. You can see that we run a very energy-efficient household. The blue spikes represent the toaster and jug in the morning, then the washing machine and then me using the heavy 3 phase welders, and sheet metal machines intermittently in the kiln factory through the day. By way of explanation, I downloaded this screen shot at 3.30 pm, so that is why the graph suddenly stops. From this brief explanation I hope that I have illustrated that it is possible to live a ‘normal’ life, carry on working and fire an electric kiln, all from a solar array and a lithium battery. The battery is a Tesla Powerwall 2 lithium-ion battery with a 15 kWh rating. The solar array is 6 kW. Made up of 3kW of 11-year-old BP solar panels made in Sydney, and 3kW of new ‘Tindo’ solar panels made in Adelaide. In both cases, we paid a premium to purchase Australian made panels to support Australian industries and Australian jobs. If there had been a comparable Australian battery. I would have bought that instead. The Tesla Powerwall 2 lithium-ion battery is 15 kW/h rating. Made in the USA. The closest Australian contender was ‘ZPower’ also from Adelaide, but at almost 3 time the cost, it was out of our price range. All these things will change quickly and dramatically over the next few years. Watch this space. You can be sure that whatever will replace our battery at the end of its life in 15 to 20 years time, hasn’t even been thought of yet, never mind being built! The kiln is one that I made myself. It is a half metre cube 500mm. x 500mm. x 500mm. constructed out of light weight RI bricks. 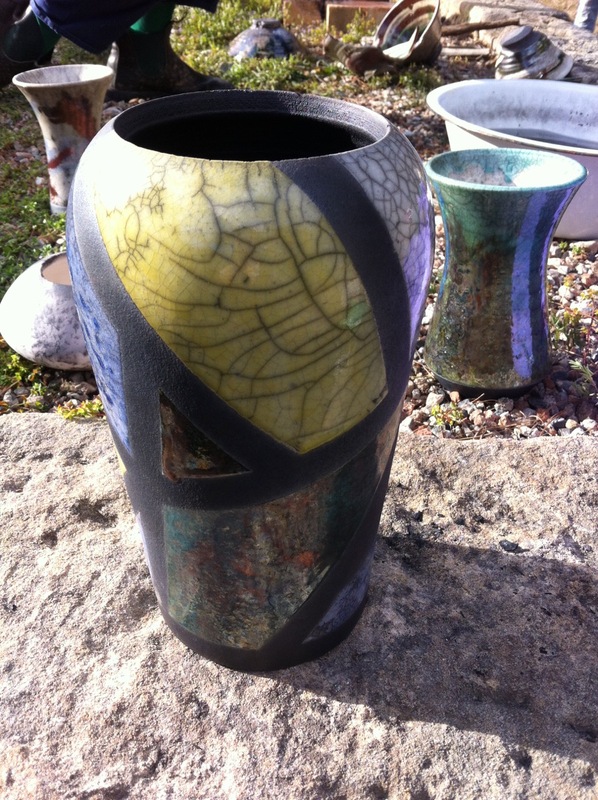 I have just finished and fired the latest little wood fired kiln prototypes. These two new kilns are a slight improvement on last years model. The big difference is the increased volume. The big kiln is built in 2 parts. This new bigger kiln is 50% larger than the older model. When fired with gas burners, the 2 part design allows the top to be taken off and the lid placed on the lower section. The lower section can then be fired with gas burners and it can be used as a small test kiln. Alternatively, the top section can be replaced and it can be fired as a small production kiln. 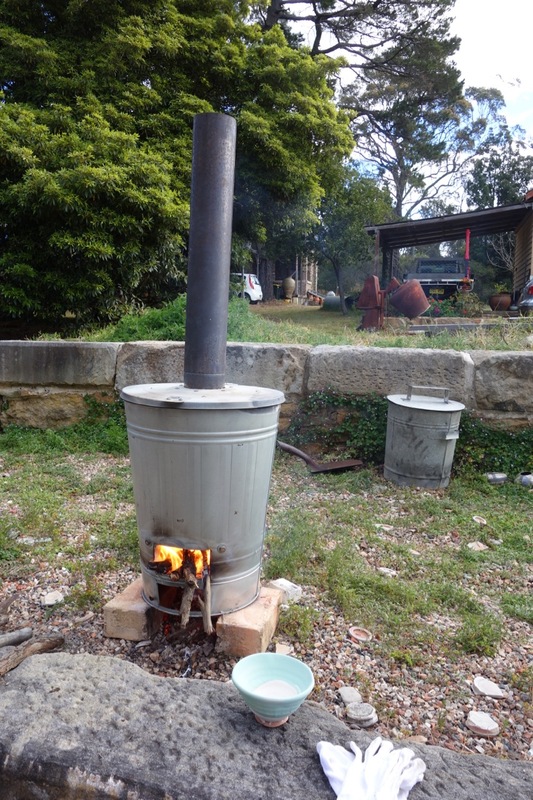 In wood fired mode, it must be fired together, as the bottom section is the fire box and the top section is the chamber. I’m very pleased with them. The bigger kiln got to stoneware, cone 10 down in reduction in just 2 1/2 hours. If I can fire it this fast, then it can be slowed down and fired as slow as you like, with plenty of power in reserve. I’m taking orders for this kiln now. 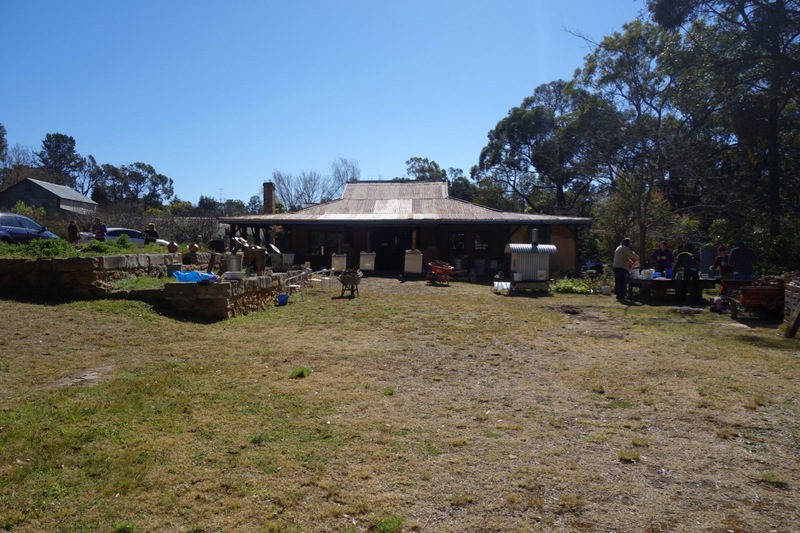 We have had our last wood firing workshop for the year, as the summer fire bans are now in place. 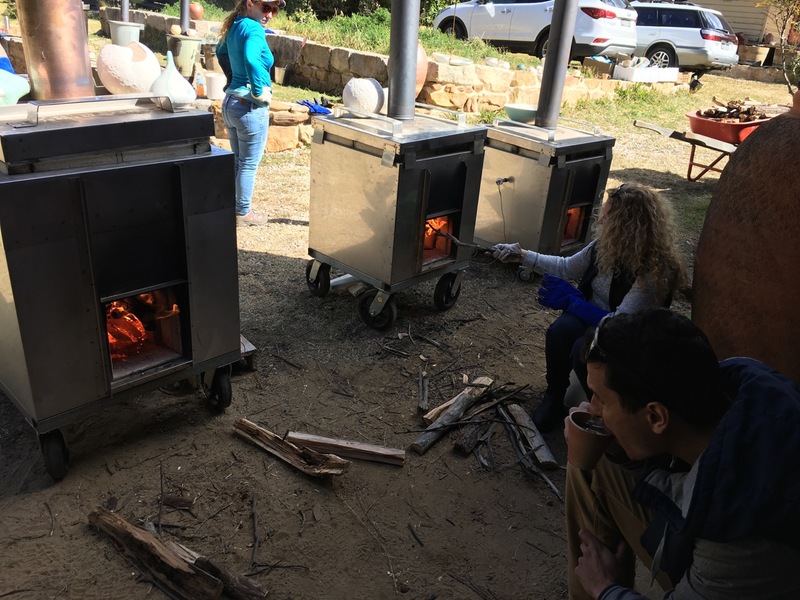 The kiln was packed and fired and marshmallows were roasted to get us through the cold night. There was a cracking good frost over night too. It was a very good firing with excellent results. 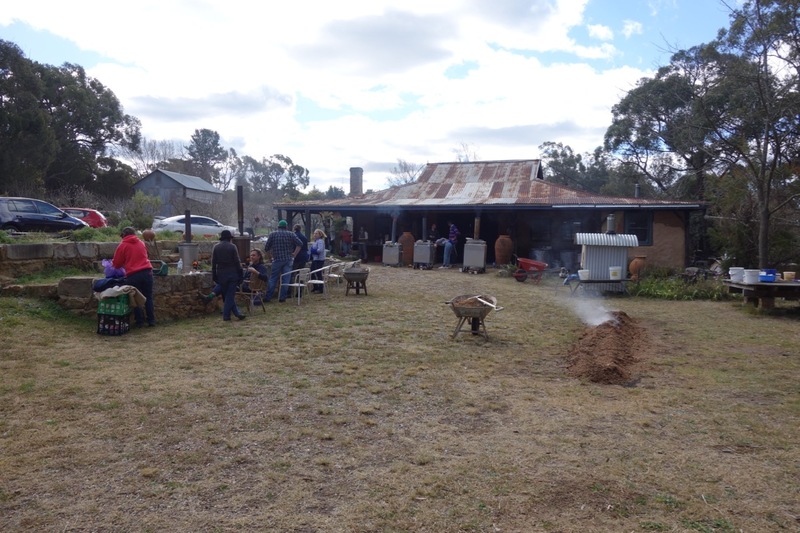 After the unpacking of the kiln, many of the potters stayed on for a working bee to help us to split wood for the next firing. It was a fantastic experience to be amongst bright friendly young people who have a lot of energy. In just a few hours we managed to fill the wood shed. This is the first time that t he wood shed has been completely filled to capacity. It a good feeling, but more-so because we were part of the team all working hard to complete an objective. 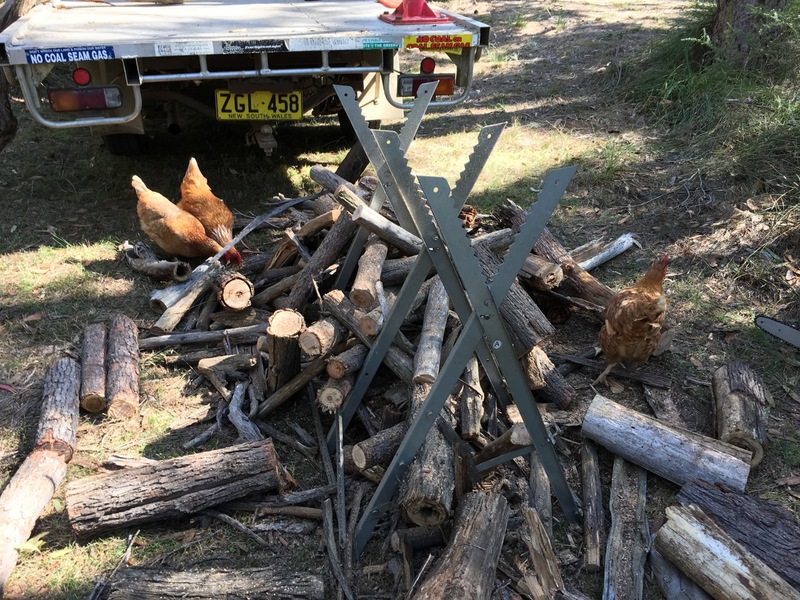 The chicken had a field day eating all the bugs that were exposed from under the bark of the logs. I’ve never seen them collapse and have to sit and rest in amongst all the hectic activity of wood splitters and chainsaws, because they had eaten too much and were completely full. My 300th kiln is all welded and has gone to the galvanisers. The workshop is now empty and ready for the next few weekend wood firing workshops. This last weekend we had our 7th workshop for this winter/spring season. Only 4 more to go and then its all over for this year. Janine and I are fully occupied collecting, cutting and splitting wood during the week to keep up the wood fuel supply. With 6 kilns going all day, we get through the work pretty quickly, as well as the wood. We glaze, pack and fire continuously all day. 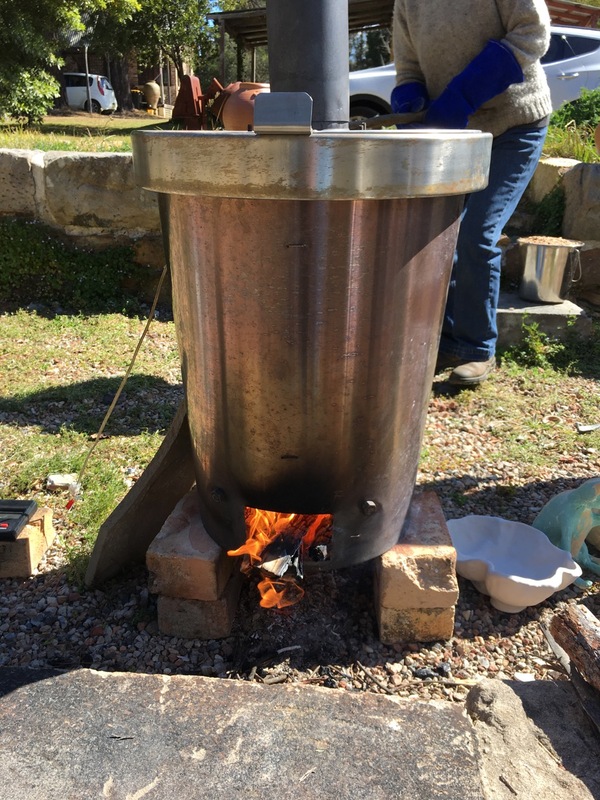 With each firing, our participants become more familiar with the glazes and the process. 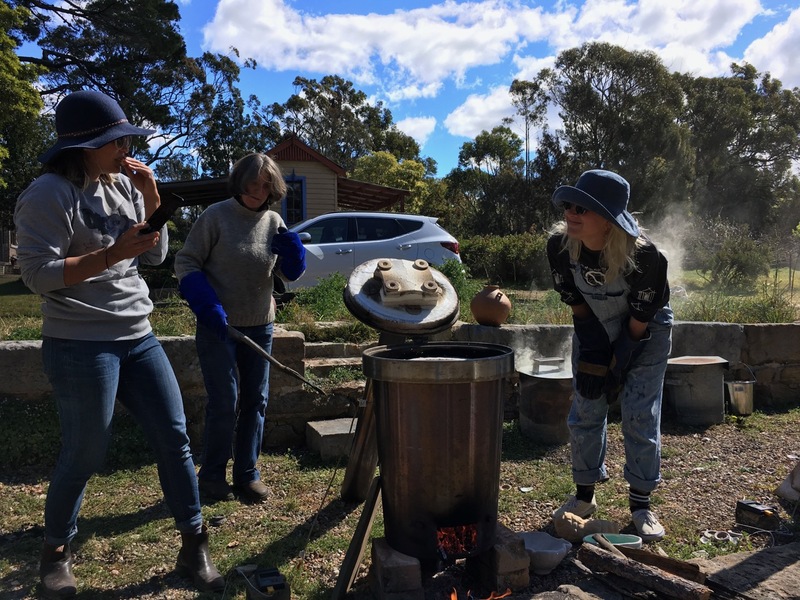 Today we have a majority of students who have not done a raku firing before and who have never fired a kiln by themselves before, not to mention that these are very hands-on wood fired kilns. It’s a steep learning curve, but we take it one step at a time and it all goes smoothly and some really beautiful work get made. 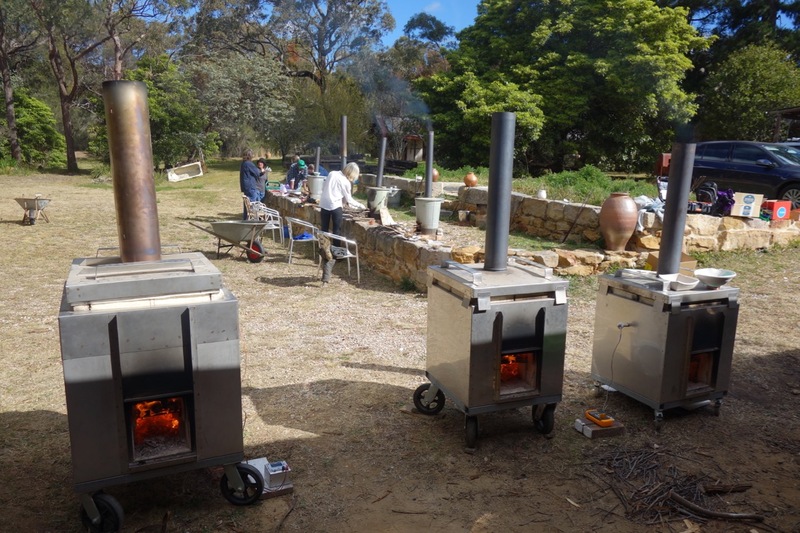 We are smack in the middle of the winter weekend wood firing workshops. 5 down and 5 to go. 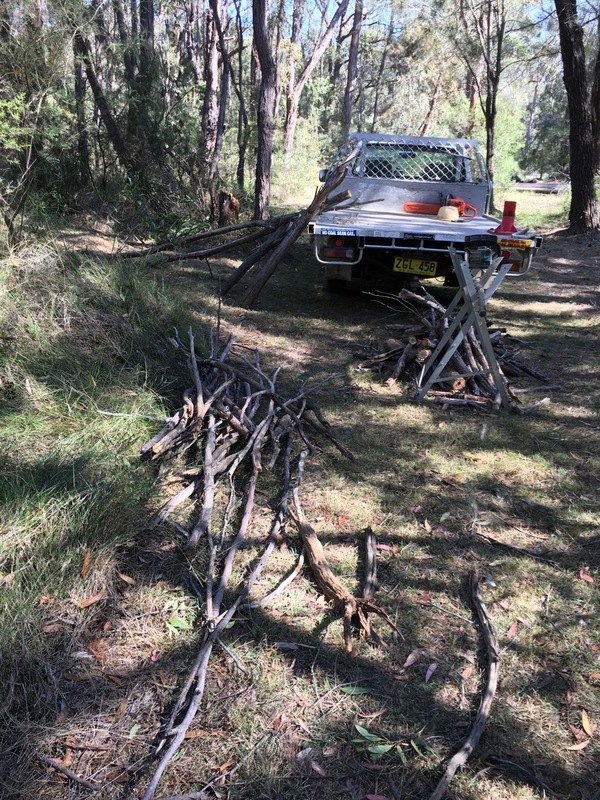 We have to take the truck down into the bushy part of our land and collect a load of small dead dry branches for the next raku firing workshop. We get through a truck load in one day with 6 wood fired kilns going all day. Collecting all of our own fuel from our own land like this is just one more aspect of our attempt at self-reliance. It’s time consuming, but fit, active, healthy work, and it helps to keep the forest in good condition. 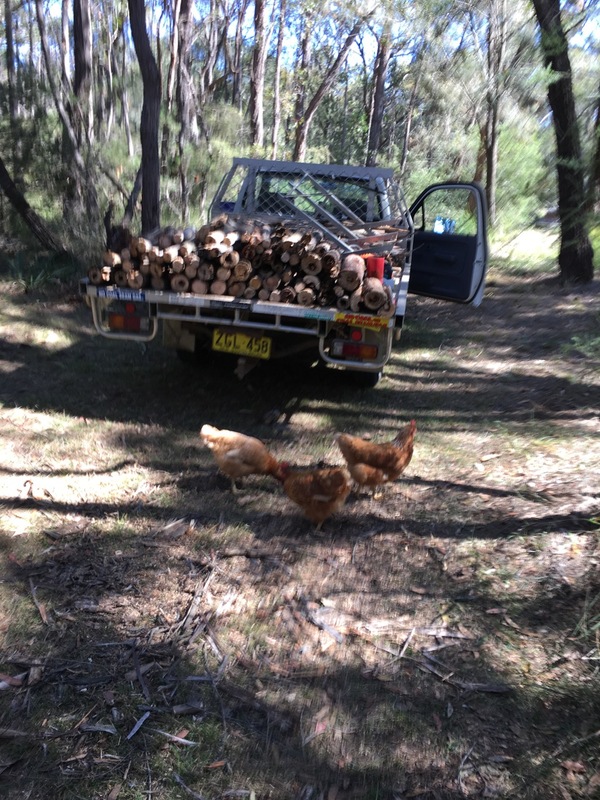 Amazingly, the chickens know the sound of the chainsaw and within minutes they appear, having covered the 100 metres across the block from the garden area where they spend most of their time, through the cherry orchard, the hazelnut grove, past the dam and the wood shed and they find us down the lane. The are motivated by food. They know that the chainsaw means termites, centipedes, under-bark beetles and cockroaches. We aren’t that happy to see them arrive here in this more remote part of our land. It means that they now know that this place exists and that they can roam here at other times. They learn their boundaries by following us. They don’t go where we don’t go. This place is the wild-wood for them and they will be very vulnerable to the fox if they come here alone. We set about dragging the dead branches out of the forest. Once we have a good pile to get started with. Janine keeps on delivering more sticks and branches to me in the track. The closest place where I can reverse to truck to. I set up the saw horse and start to cut the branches into smaller sized pieces, suitable for use in the little Stefan Jakob style bin kilns. 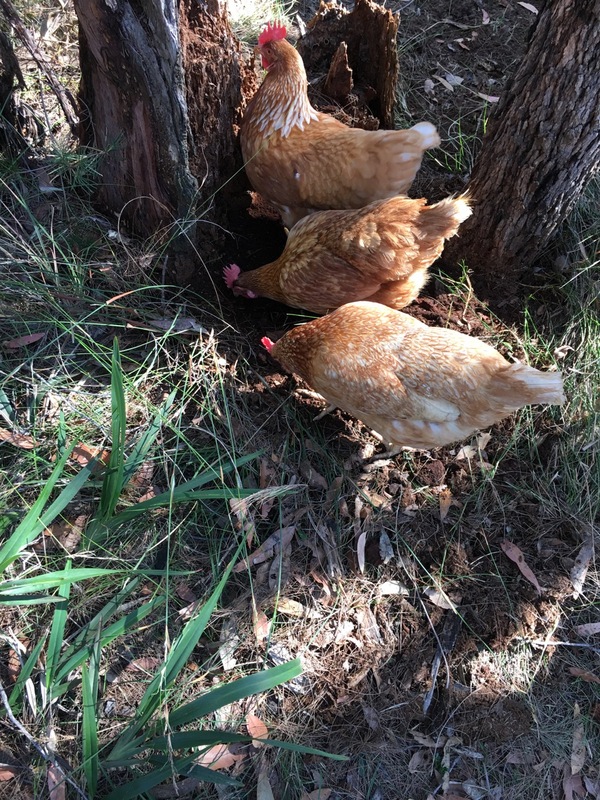 The chickens have no fear, they love to get in right under the saw to catch the falling bugs. I have to persuade them to look elsewhere in a rotten tree stump to excavate for termites. It works for a while but they are soon back in my wood pile, under my feet. They have decided that they love sugar ants and their larvae, that are falling out of some of the hollow rotten logs. When we have loaded the truck, the chickens don’t want to leave this new exciting site that they hadn’t previously known about. We have to go back and entice them to follow us to safer ground, closer to the house. They wouldn’t last too long out in the bush. We need to drive the truck up to the wood shed so that we can split the thicker section logs down to thin pieces suitable for the small fireboxes on these little kilns. As soon as the splitter engine starts up, they soon appear, ready to ‘help’ Janine with the wood splitting. 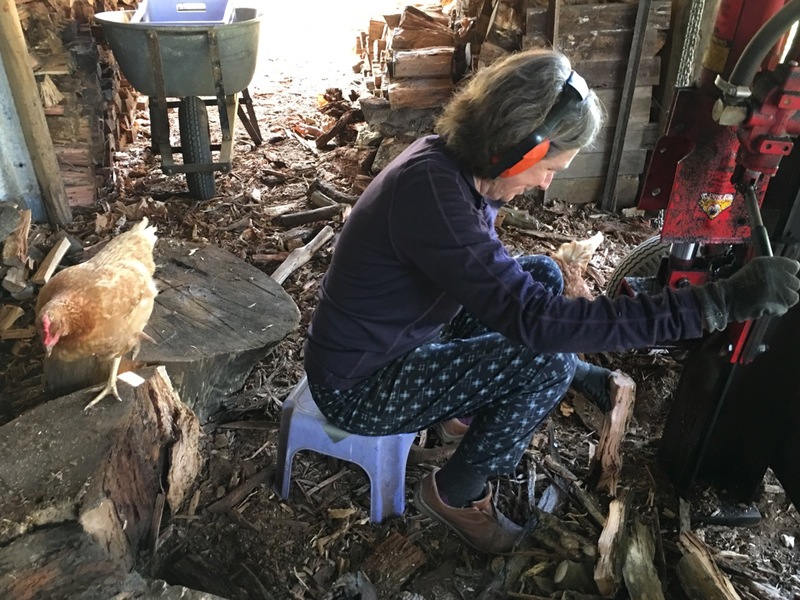 I sharpen and service the chain saws, while Janine and her ‘helpers’ finish splitting the last of the wood. The workshop is a success as they always are. Everyone getting a chance to fire their own work in their own kiln, usually working together in pairs or small groups. The day ends with a little shower of rain, that sends us under cover for a few minutes, but it soon clears to a light sprinkle and we are all back out there cleaning up and washing the finished pots, raking the saw dust looking for lost pieces or little parts that have broken off. At the end of the day, the truck is empty and there are just 6 pieces of wood left in the wheel barrow. 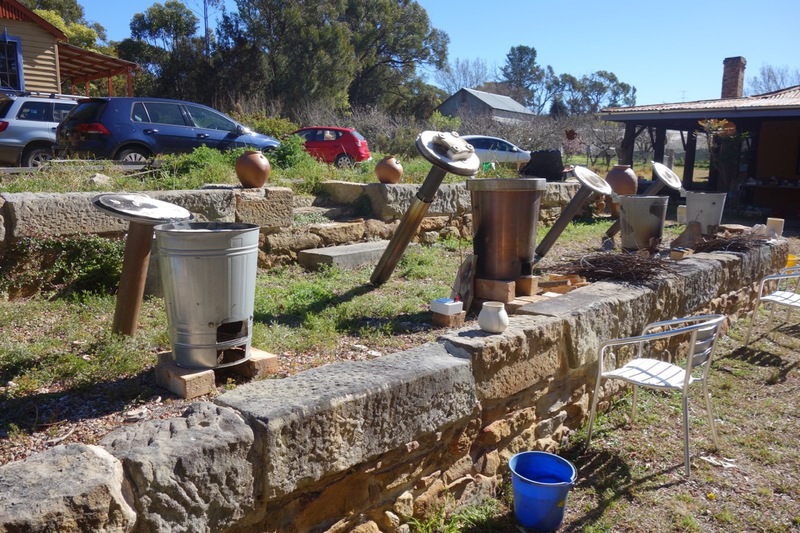 We have just completed our 4th wood firing workshop for the season. We still have 4 or 5 to go before spring, the hot weather and possible fire bans arrive. 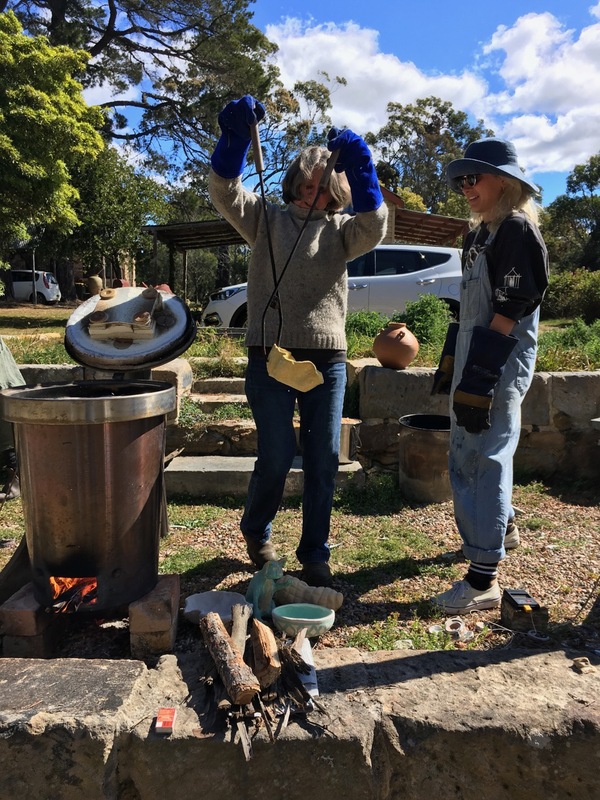 We hosted 11 potters in our workshop for a low temperature ‘raku style’ firing day. We have re-arranged the order of the kilns for this event, placing all the small ‘Stefan Jakob’ style ‘IKEA’ Garbage can kilns up on the stone wall. In this way the potter doesn’t have to bend down to stoke the firebox, but instead, can sit in a more relaxed fashion in a chair while stoking the kiln. This is much easier for some of us of advancing years. The larger and heavier brick lined portable kilns have to stay firmly on the ground where we can wheel then out for firing and then back again under cover for storage. We were blessed with a beautiful day with no wind and beautiful sunshine – almost hot. Such a great day for an out door workshop. The week preceding had been dreadful with strong, icy southerly winds blowing off the snow. Everyone seems to be happy and some excellent results are achieved. We are now about half way through our firing workshops for this year. 4 down and 6 to go.